A TPP action game, another entry in the popular horror game series. Resident Evil 5 takes place 10 years after the destruction of Racoon City. Main hero – Chris Redfield – travels to Africa to investigate origins of the mysterious T Virus that changes humans into zombies. 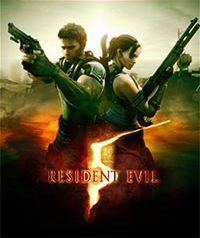 Resident Evil 5 is another entry in virtual horror series, known in Japan as Biohazard. The reason why Country of Cherry Blossoms has been mentioned is because it is home to Capcom company, which created the whole series. Though it has been developed under the lead of Jun Takeuchi, father of Resident Evil (as well as Onimusha), new part differs visibly from its predecessors. The fifth Resident Evil starts 10 years after destruction of Racoon City, in 2008. We accompany Chris Redfield during his trip to hot Africa – an area of origin of mysterious T-virus. With his newly assigned partner, Sheva Alomar, he is ordered to prevent sale of BOWs (Bio-Organic Weapons) on black market. Soon they find out that locals have been infected and turned into zombie-like creatures called Majini. As if it wasn’t enough, two agents learn of an existence of new type of virus. Eastern developers of Resident Evil 5 for PC, PS4 and etc. gave up on locked camera, which has been present in horror games like Alone in the Darkseries. Now we observe our hero from behind, like in typical 3D action games. Another change comes in form of environment, as we explore e.g. a desert during daytime. But the fear remained key element of gameplay, mainly due to various monstrosities. As usual, protagonist is given wide variety of weapons to deal with enemies who outnumber him – weaponry consists of knife, shotgun, pistol, machine gun, grenades etc. Selecting PCs along with Xbox 360 and PlayStation 3 as target platforms allowed Capcom’s developers to create highly detailed visuals, generated in real time with 60 frames per second animations. Virtual surroundings are especially eye-catching, as we can notice realistic textures, dynamic play of light and shadow, weather effects etc. Character models are equally well-made – we can see, for example, main’s hero natural beard, and sometimes even his eyes with slight dark rings around them. It is noteworthy that this is the first Resident Evil game released for stationary console of Bill Gates’ company. In this text I have mentioned the description of passing the main script, the location of 30 hidden emblems as well as all things which can be unblocked without using so called Exchange Points.